After making the Washi Tape Light Switch I had a thought based on a few craft ideas I had seen. As a book lover, I am always searching for a bookmark. I have been known to use post it notes, random pieces of paper, my Nook, the list is endless. 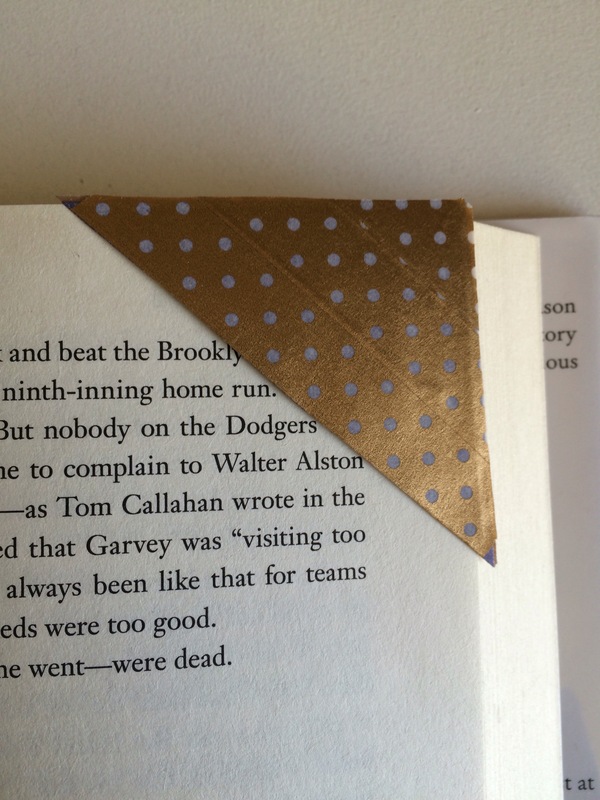 So I love the idea of easy to make on the go bookmarks in case I leave mine or forget it somewhere. Cut the corner off of an envelope. I had a purple one that had lost its matching card. Overlapping strips of Washi tape, completely cover the envelope on both sides. Trim the edges down, close to the envelope. Press any remaining edges together. Make sure the open edge of the envelope stay open, trimming down all the way down to the paper. I made two different sizes, both fit all my books nicely! I use the gold for my fun reading, and the blue/green pattern for my work/marketing related reading. I made the same one with envelope corners!!! Cute! Fantastic! I have started using these exclusively lately! Cool! They’re super cute & handy!